When a parent hears the name of popular educational kid’s brand, ‘VTech‘, mentioned, they automatically think of exciting toys that are the authority in child education as well. Lucky for parents everywhere, VTech apps are no different! Blending entertainment and learning, VTech knows how to keep kids engaged and happy and that’s what makes the release of their new ‘Switch & Go Dino’ app so exciting! Once the child has chosen a dinosaur and the poster is printed, then the fun begins! 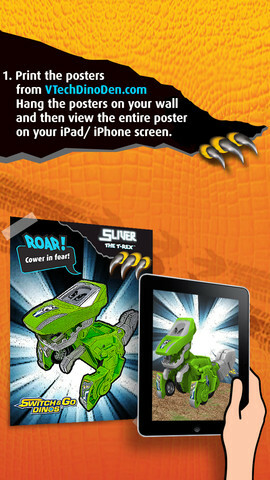 Using the iPad camera link inside the app, children can view the poster through the iPad. 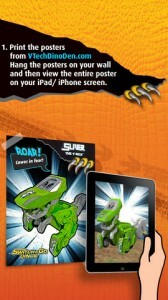 Once the app recognizes the poster, the dino that parents printed comes to life on screen! By touching and tapping the on screen dino, kids can make it roar, move and, of course, transform, just as the name of the app implies. Seeing the 2D graphic change into an augmented reality-style 3D dinosaur is amazing! Released just this week, one of the great things about this app is that it is free to download. While it may take a little extra effort to print and put together the poster, the interactivity that this app offers is worth the time involved. The great think about the wide selection of posters is the newness factor. After your child has exhausted one dinosaur, there are still many others available to keep the app new and exciting for much longer than traditional kid’s apps. VTech’s ‘Switch & Go Dino’ app is available for download from the Apple iTunes App Store for free via the button below. This app is supported by both iPhone and iPad and required iOS 3.1.3 or later.